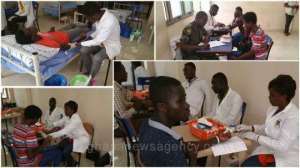 The Regent University of Science and Technology has donated about 50 pints of blood to the 37 Military Hospital. Mrs Vida Adubea Oppong, the Acting Director of Educational Support Service Unit of the University said it undertook the exercise upon themselves because blood donation meant saving lives of the sick, accident victims, and other life threatening emergences. She said the school as part of its semester activities undertook some community beneficial projects towards enhancing the livelihood of people. 'Last semester for instance we were at the Leprosarium at McCarthy Hill to clean and donate some items to them, and this is what we have chosen to do this semester, next year too, we will do something else', she added. Mrs Adubea said the exercise, sponsored by Fanmilk Ghana, would go a long way to benefit students and staff who participated in knowing their health status and blood grouping. Mr Benjamin Larbi, a Communications Officer at the University told the Ghana News Agency that the exercise also was aimed at incorporating the spirit of volunteerism and giving back to community ideals into students. Mr Larbi said the idea of doing something without being paid for society was fulfilling and that was what the University hoped to teach its students. "We found out from a recently released data by the Ghana Blood Service that blood stock in the country was critically low and that if one per cent of the Ghanaian populace donate blood on regular basis, it will be enough to take care of the huge demand for it. 'So this is one way of helping to solve that problem and what can be more noble than giving some of your blood to those that need it if it will save their lives? he added. Mr Eric Tsatsu, a level 300 student at the University told the GNA that he decided to donate because his sister's life was saved by some graceful donor when fell ill.